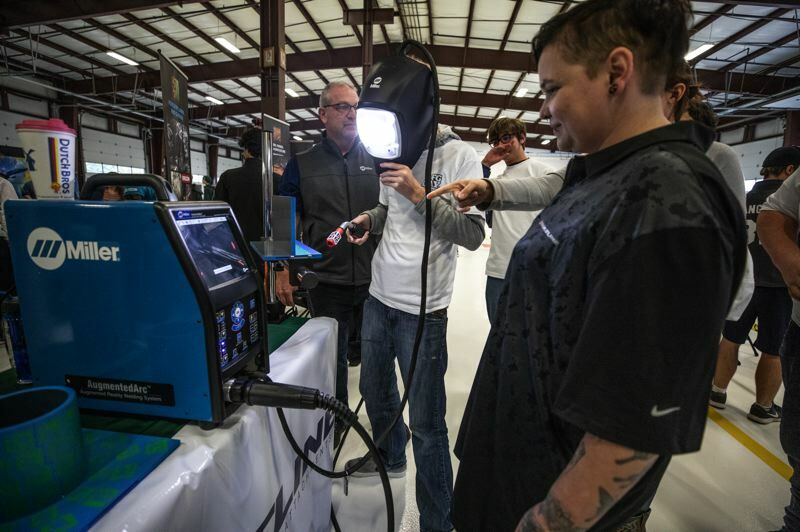 National Manufacturing Day, recently held on Oct. 5, is designed to get teenagers excited about going into manufacturing, whether entry level at 18 or later after a college degree. This year, 270 school kids from Columbia County and west to the coast, descended on the Oregon Manufacturing Innovation Center Research and Development (OMIC R&D) in Scappoose. The building is a former 18-wheeler repair shop which opened in 2008, but fizzled out because of the Great Recession. It sits next to Scappoose Sand & Gravel, accessed along Northeast Crown Zellerbach Logging Road, although there wasn't a tree in sight. Outside it was all heavy industry — trucks driving through wheel washers and bulldozers moving stones around beside a rain-lashed quarry. Inside, it was warm and the concrete floor was clean. On display were the toys of a new wave of manufacturing: lathes the size of subway cars, virtual reality welding games and mobile robots working on their ball control. Around the side were tables with drill bits from tool makers such as OSG and Sandvik. Evraz the steel maker had steel coasters shaped like Oregon, and blocks of steel partially penetrated by rifle bullets, as if time was frozen. The day was billed Makers Gone Pro West, a take on a similar one held annually in Gresham since 2014. Craig Campbell, OMIC R&D's executive director, warned everyone to stay back behind the taped lines on the floor and not to touch anything sharp, stressing safety is paramount in manufacturing. "If there are any injuries today we will turn them into a mocking Sponge Bob meme..." he joked. The high schoolers began by sitting on the floor with box lunches while listening to Suzanne Bonamici, the U.S. Representative for the state's 1st congressional district. Bonamici is on the Education and Workforce Committee, and the Committee on Science, Space, and Technology. "What are the jobs of tomorrow?" she asked. "This is a chance to find out about great jobs here in Columbia County." She called OMIC's research and development center "great public private partnership. It's an example I talk about in Washington, D.C., as how we prepare people for the jobs of the future and get the skills our manufacturers need." 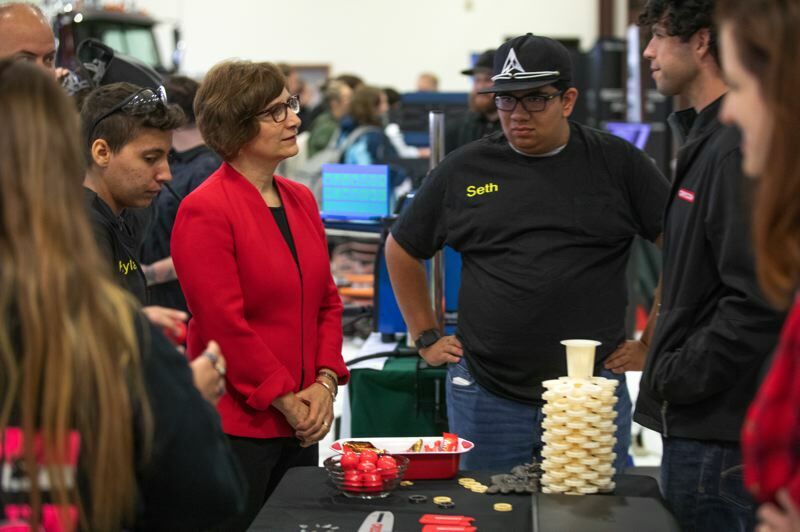 Bonamici told the Business Tribune that the there is no longer a one-size-fits-all approach to education, meaning the expectation that everyone would go to a four-year college. "It's just not right for everyone, especially those just out of high school, and those who want to go into the trades." A big part of keeping the economy agile is education and industry working together. "I've been a big supporter of the partnerships that connect the business community with education, to make sure students are getting the skills." This has led to PCC Rock Creek having a solar energy program, because it is near Solar World, and Yamhill County's Chemeketa College having a viniculture program. With OMIC she thinks kids will be drawn into manufacturing and even supply chain jobs. From her position on her committees she sees the following job growth areas on the horizon: "The need for more experts in cybersecurity, quantum computing and precision medicine. And as a member of the science committee, I support investing in the basic research that leads to that." There is OMIC R&D which just opened, and Portland Community College's OMIC Training Center, which opens in fall 2020. Portland Community College has earmarked $14.4 million for the OMIC Training Center which includes $3.5 million for property. The R&D center is a collaboration of industry, government and higher education, including Oregon Tech, PSU and OSU. Marc Goldberg, PCC's Associate VP of Workforce Development explained that research scientists will work at the center on projects set up by industrial partners. "Research projects that will support their manufacturing needs, to create products quicker, more efficiently and greener." When it is built the training center will be more like the one in Sheffield, UK, which trains thousands of apprentices every year. Part of the problem is manufacturing doesn't have much apprentice infrastructure, unlike plumbers, electricians and sheet metal workers — construction jobs that have never been offshored. John Niebergall was there with the Northwest Regional Educational Service District. This covers 20 school districts from Tigard to Tillamook to Astoria and back to Scappoose. Niebergall was a career tech end teacher in Sheridan for 30 years and then got a grant to give out digital fabrication tools. Now he's the Johnny Apple Seed of 3D printers and vinyl cutters. He says he can "talk the teacher talk" as well as talk to industry. "I help build the pipeline of kids into OMIC," he says. He's helping teachers to evaluate their skillsets and equipment, to get their kids first in line to use OMIC. For example, Scappoose and St Helens high schools are figuring out how to have a welding class after school. Is there a sense of urgency to get these teens skilled up? Yes, he says, from employers, but not from parents. "No. In my 30 plus years in the technical world, employers have not been knocking on our doors. Now they're saying we need these kids and we're ready to help them get ready, financially and by telling us what the skills are those kids need." Three skill sets they are focusing on are precision manufacturing, welding and mechatronics. The latter is a combination of robotic, pneumatics and hydraulics. It's taught now at PCC Rock Creek. "It's trouble shooting wafer machines, things with hydraulics and lasers," Niebergall says." Craig Campbell, the Executive Director, said one of the large lathes arrived in April, the other (the Okuma) just three weeks ago. He outlined to the Business Tribune the sort of research they will perform. "One is whether certain drills can drill precisely so they don't have to go through a second process called reaming," Campbell said. "Taking that out of the process means it's faster and less expensive." College professors and research students will do the work. He hopes when the training center is open PCC students will be invited to see how research is done. The training center will be across the highway, but he wants to attract other partners to the 10 acres on which the OMIC R&D center sits, beside the quarry. He cites OSG, the Japanese toolmaker and coatings company, as one of the first to commit. It is opening up a field office right next door. Is Campbell optimistic that manufacturing will come back to the US? "I'm hopeful manufacturing grows everywhere because we need it. But yes, definitely here in the U.S., especially if we can provide young people with advanced manufacturing skills. That's one of our biggest challenges. Manufacturers desperately need people with those skills." He says that the need to outsource to Asia is declining. provide that training and the people are here." Campbell says repetition is what robots do best. "Most of the things that are being automated are dangerous and repetitive, where a human error can cause a big problem, and a lot of the rest of it is assisting people in the manufacturing process to do it better. You're never going to take people out of the process. We need humans in there, and we need a lot of them."